David Brooks was born in 1975 in Brazil. He studied art at the Städelschule, Staatliche Hochschule für Bildende Künste in Frankfurt am Main, Germany, and The Cooper Union, School of Art, New York and completed his studies at Columbia University, School of the Arts, New York. Brooks presented his work Preserved Forest, 2010, in MoMA PS1’s 2010 Greater New York show. 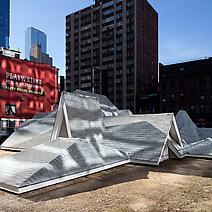 In 2011, David Brooks showed his critically acclaimed Desert Rooftops, in the Last Lot in Times Square. Brooks’s forthcoming shows include solo shows at the American Contemporary (New York) and the Galerie für Landschaftskunst (Hamburg). Brooks lives and works in New York City.